Alex Krulikowski - Effective Training Inc. 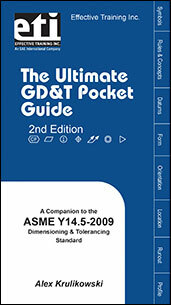 The Ultimate GD&T Pocket Guide explains the most common rules, symbols, and concepts used in geometric dimensioning and tolerancing. ...This one-of-a-kind reference guide includes over 100 detailed drawings to illustrate concepts, more than 40 charts for quick reference, explanations of each GD&T symbol and modifier and much more...Written by standards expert Alex Krulikowski, this valuable on-the-job reference clarifies how to interpret standard-compliant technical drawings that use ASME Y14.5-2009. If you do not have access to SAE MOBILUS via username/password or institutional access, you can still purchase the Book, 2009 Ultimate GD&T Pocket Guide 2nd Ed.